The September luncheon involved a bit of fangirling on my part, as I got to host Liz Ellis. Like many of my generation I grew up playing Netball (for those of you wondering, Wing Attack was my position) and Liz is clearly a superstar of the sport. Thanks to our partnership with Greater Bank we were able to have Liz come to Newcastle to speak to a packed room. In fact, we had people trying to get tickets in the hours prior, but we couldn͛t fit them in the room! Liz Ellis is one of Australia’s highest profile elite athletes and most successful netballersever. She surpassed the record for most test matches played for Australia in 2005 and captained the Sydney Swifts and Australian Netball Team until her retirement in 2007. Liz was led through a 45-minute Q&A by Glen Hawke. If you’ve been to a major sporting event in the past 20 years, there’s a chance you would have heard Glen’s voice or even seen him on the stadium vision screen. He just wrapped up his 16th season as the voice of the Newcastle Knights at McDonald Jones Stadium. And over the past five years he has been front and centre as the announcer or on-field host at some of Australia͛s biggest sporting events including the Gold Coast Commonwealth Games, NRL Grand Finals, State of Origin and more! 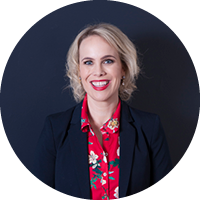 Whilst she was building her netball career, Liz was also studying a Bachelor of Arts/Bachelor of Laws at Macquarie University, graduating in 1996. She then practised Property and Infrastructure Law with Corrs Chambers Westgarth from 1997 to 2000. Not content with all that, she launched the Liz Ellis Netball Clinics in 1997 and has coached enough kids over the past decade to twice fill Sydney’s ACER Arena. Glen asked Liz about all of this – and more – and Liz was entirely open and honest. She even admitted she doesn’t have a filter, and that certainly was true! One of the key things that resonated with me was a saying that has garnered a lot of attention in recent years, which is You can’t be what you can’t see. Liz was referring not only to women in sport, but diversity in all areas of life. And a lot of this has to do with access to training and education. This led nicely into when we bought local, Sam Poolman, (who has just been re-signed to the Giants) up on stage to join Liz and Glen, as when she was coming up the ranks she had to travel to Sydney 5-6 times every week, in order to access the Netball training she needed. Reflecting on her own experiences, Sam wanted to provide high level Netball training in the Hunter region, which is why she established the ASPIRE Netball Program. When I first broached the subject with Greater Bank about trying to get Liz Ellis to speak in Newcastle my work was done for me. Greater Bank were onboard immediately! And this is because they are committed to supporting the communities that support them. One of the ways they do this, is through support of Netball in the Hunter region. In 2018, Greater Bank is again the major sponsor of the Greater Newcastle Open Championship, as well as a supporter of a number of other associations across the Hunter and beyond, including Penrith, Kurri Kurri and Nelson Bay. They are also supporting the sports pathways through its major sponsorship of the Hunter Academy and Central Coast Academy of Sports Netball Programs. And no surprise here, they are big supporters of Sam’s ASPIRE Netball Program. So, obviously the idea of having Netball royalty like Liz Ellis come to town aligned perfectly with Greater Bank! We only have a few more luncheons left for 2018 – I encourage you to come along and experience our amazing speakers for yourself.